Visiting the Statue of Liberty is one of the most popular visitor experiences in New York City. Since 9/11 and the implementation of heightened security procedures, there hasn't been a great way to manage and educate the crowds of visitors. A tent was set up to contain the security scanners, but the long line of people queues up outside in Battery Park. Tickets are sold at a separate nearby site - the old Castle Clinton historic site. 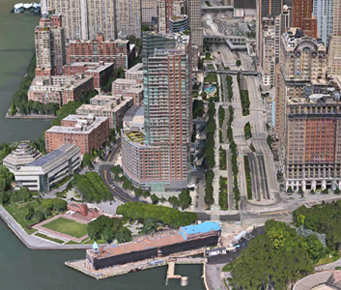 But, a better solution has been sitting in Battery Park for many years. 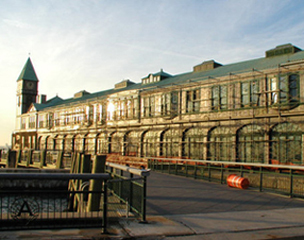 Pier A is the only remaining Victorian-era pier along the Hudson River. For decades it has sat silently behind a construction fence as the city debated what to do with the building. Idea: It can be repurposed as the home for the Statue of Liberty experience: selling tickets, queue line, security scanners, historic exhibits, boat boarding, and souvenirs and food service. Imagine the complete immersive immigration experience - it starts as the guest approaches Pier A and sees the period architecture. 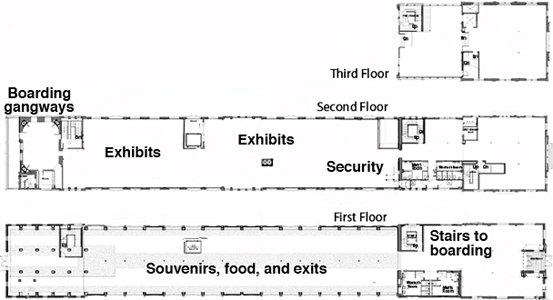 Inside are a foyer of ticket booths, stairs, escalators, and elevators to the second floor. Up on that level are exhibits and the security checkpoint, more exhibits, and a crowd waiting area replicated to imitate the immigrant experience. 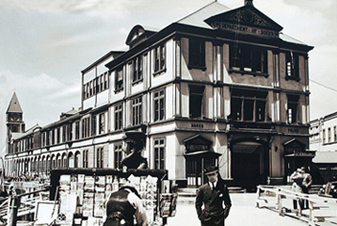 The boarding area is patterned after European docks of the 1920s. The interior design conveys the crowded sense of waiting to board a ship for the New World. Two or three gangway boarding walkways extend to the second level of the ferries. This allows simultaneous boat exit and entry - guests exit the boats on the lower level and enter the boats on the upper level (where most guests end up, anyway) - this will speed up the transfer of visitors. The ferries then sail across the harbor to the sight of the statue, just as many immigrants experienced her. The boat vessel has a mutimedia presentation to recreate an immigrant's voyage and arrival. There could be large screens playing videos of recreated immigrant boarding and sailing scenes. Then when in view, the screens could give way to the actual view of the Statue in the harbor - just as immigrants caught a glimpse of it. Then on to Ellis Island. The debarkation docks on Ellis and Liberty Islands continue the period look. Another sight is the Jersey City train station where most immigrants arrived by ferry from Ellis Island and caught a train to a new life in Chicago, Cleveland, St. Louis, and up and down the east coast. 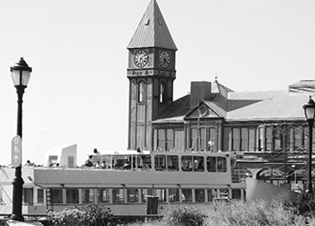 Upon the return voyage and debarking the boat, the guests exit down a wide gangplank and through the first floor of Pier A where there are gift and food kiosks, seating, and views of the harbor. The enhanced experience turns the Statue visit into an event, a show worthy of the half-day time requirement. Routes of the ferries from Pier A to Ellis and Liberty Islands. 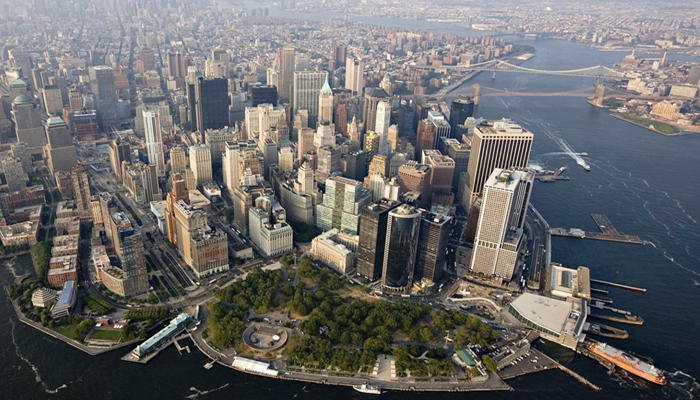 Pier A is at the tip of Manhattan in the upper right. The red dots are, from top to bottom, the Jersey City Train Station, Ellis Island and the Immigration Museum, and the Statue of Liberty. 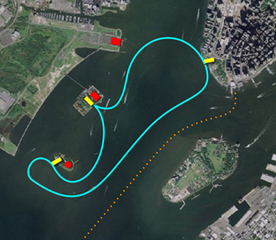 The orange dotted line is the route of the Staten Island Ferry. 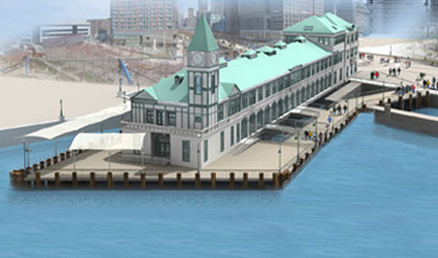 Right: Pier A is the light blue dot in the lower right. 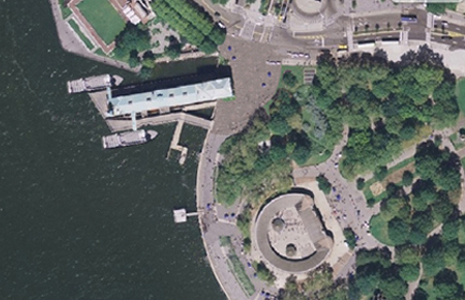 The entry plaza with ample space for crowds of visitors without compromising Battery Park. • Pier A allows the entire mainland experience to be consolidated in one embarkation and exhibit building, providing a landmark identity. • A larger, more visible, entry plaza on Battery Place allows easier traffic flow of visitors from buses, taxis, and subways. • Moving the ticket booth out of Castle Clinton frees it up for historical exhibits, a more appropriate and respectful use of that building. 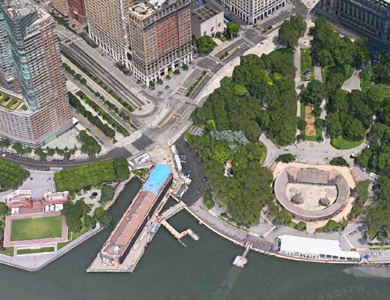 • Battery Park is rid of the temporary white tents and tacky crowd barricades. 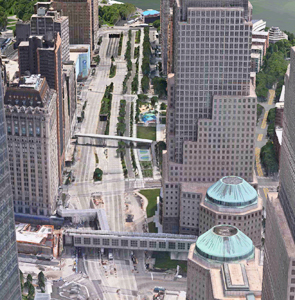 • More of the Battery Park river walkway is opened up for better vistas of the harbor. • Security checks can be conducted in a more secure and less obtrusive environment. • The queue line is indoors, out of the weather elements. Videos and exhibits can occupy the attention of those in line. 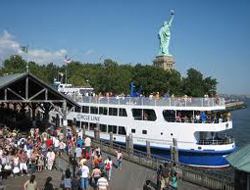 • Space for immigration/Statue exhibits is provided for waiting visitors and for the many people who choose not to visit the statue or arrive too late to get a ferry ticket. • Two-level loading and unloading speeds up the process and shortens visitor waits. • Space is provided for vendors of food and souvenirs, protected from the elements. 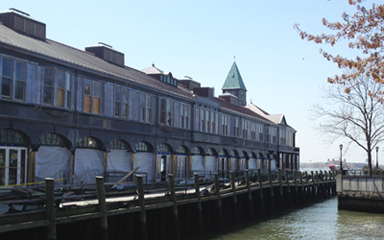 • A landmark for the experience is visible from along West Street, Battery Place, and Battery Park. A miniature Statue on the top of the flagpole on the Pier A roof provides a strong and familiar visual reference. 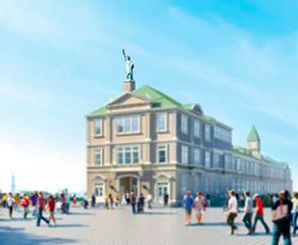 • The cohesive continuity of buildings: Liberty Island, Ellis Island, Jersey City Train Station, and the new Pier A Visitor's Center become major components of a comprehensive Immigration Experience. 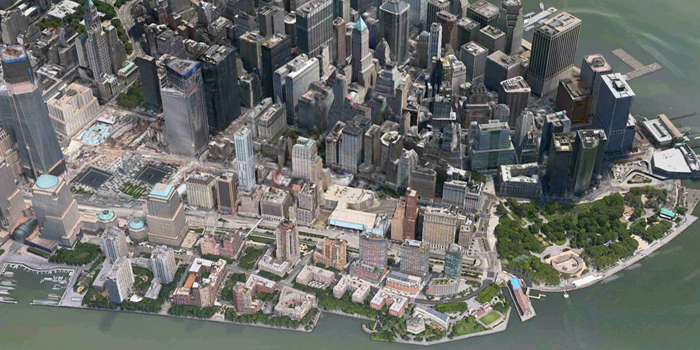 Midtown is at the very top, Battery Park at the bottom. Pier A juts into the bay on the lower left. The current Statue ticket booth is in the round structure in the park to the right of Pier A. Towards the water is the white tent that houses the check-in and security lines. 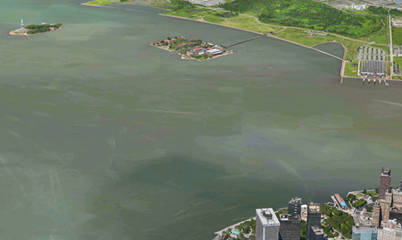 Below: 9/11 Memorial is left center, Staten Island Ferry is right center. Enhanced visibility at the edge of Battery Park and at the foot of West Street that runs up the Hudson side of Manhattan. The WTC and 9/11 Memorial are a few blocks away. 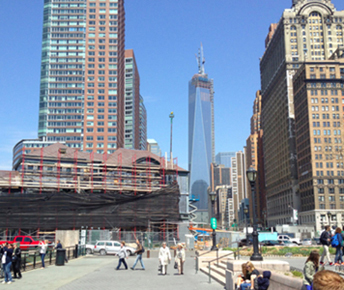 Downtown, or Lower Manhattan, needs a comprehensive history museum. 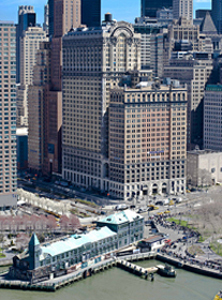 The most historical part of the metro area is within a few blocks of Pier A: early Hudson shipping and piers, Battery Park, early naborhoods, Castle Clinton, Statue of Liberty, Governor's Island, Customs House, Bowling Green, World Trade Center, City Hall, Park Row, Woolworth Building, Wall Street, Fraunces Tavern, Stone Street, Delmonico's, and many more significant sights. 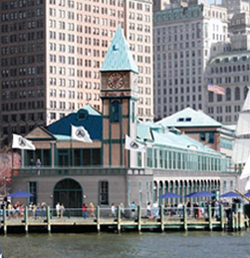 Pier A is well located to serve as a starting point to explore downtown. In the front section could be ferry tickets, harbor cruise tickets, the TKTS booth (move from the Seaport or add a third location). The second floor with its great views of the harbor could accommodate at least two restaurants. 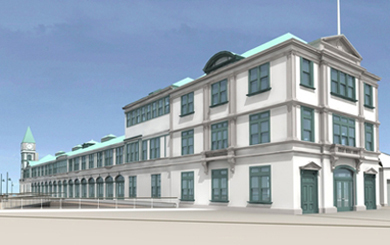 The entry level could contain gift shops to take advantage of the mass amounts of tourists.